As a fan of GI Joe, I’ve been “trained” since I was a youth that “Knowing was half the battle”.. I’m always interested in learning how to do things, fix things, tweak things. A few months ago, NewTek’s CEO told me about an series of books called “The Traditional Bowyer’s Bible”. I purchased a set from Amazon and have been trying to absorb the extremely technical information found in the series. You can read about stuff forever but the fun begins when you try to DO SOMETHING with what you have learned.. In Volume Two, they cover the concept of making a bow from “home depot” lumber. Today was the day for me to make my first “board” bow. I headed down to Home Depot and found a nice 1×4 that had the wood grain running in the correct way. The board had a few knots but it looked pretty good. 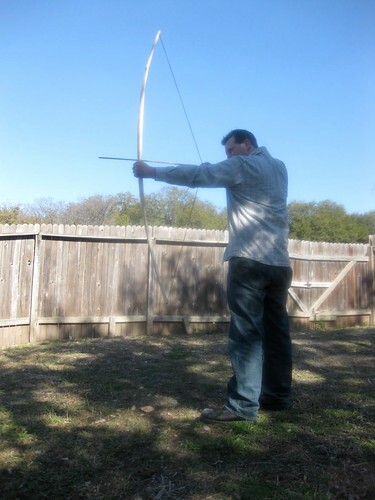 As my guide, I used the “building the perfect bow” article found on pg 92 of volume one. 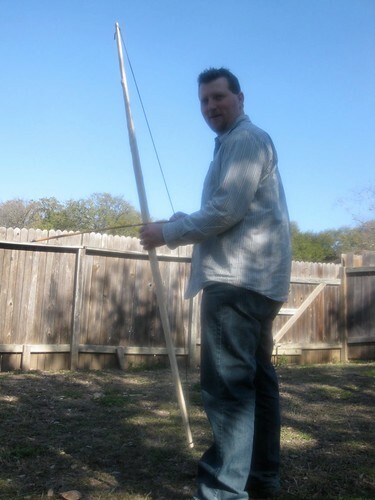 The idea was to make a 70″ bow that was 1 1/2″ inches in the middle and tapered out to 1/2″ at the end. The first shot! Notice the string is a little long. After the first successful shot, I was feeling pretty good and decided to try again. This time, I pulled the string back a little further and.. CRACK.. To my surprise the break didn’t happen at the knot but it broke on both ends where I started to taper the bow back to the 1/2″ end! 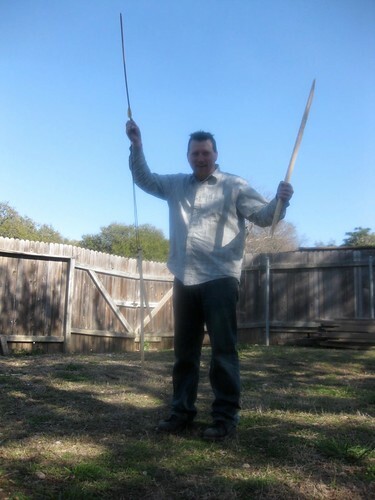 My first bow, broken it two places..